520-DST is rated 4.5 out of 5 by 15. Rated 2 out of 5 by Sailorgirl81 from Drain pull doesn't work with backsplash I got this faucet after reading all the great reviews. When we went to install it, we found that the drain pull handle is on an angle. If you have a standard countertop with a backsplash, you can't pull the drain closed because it pulls on an angle, instead of straight up and down. I had to buy pop-up drains in order to be able to use this faucet and was not happy about this extra expense. So, if you buy this faucet, be aware that you need at least a couple of inches behind it, in order for the drain pull to work. In this photo, we removed the drain pull handle because it's no longer needed with the popup drain and doesn't work anyway. Rated 5 out of 5 by alyc from Replacement is amazing I received this faucet as a replacement for a prior model. It, along with Delta's customer service exceeded my expectations. Love the new faucet. Sleek, stylish and simple. Easy to install and works great! 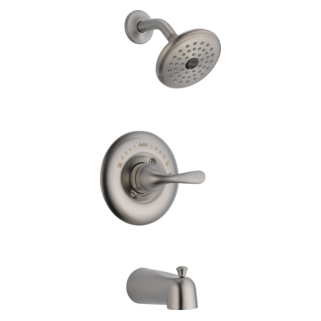 Rated 5 out of 5 by GaryT from Great faucet, replace yours today! 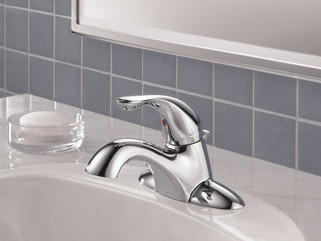 This Delta lavatory faucet is excellent! It has been in use in the master bath since a recent remodeling. I installed it on a granite counter top where it looks and performs great! Installation was easier than previous ones. The pre-attached supply lines are an excellent feature. 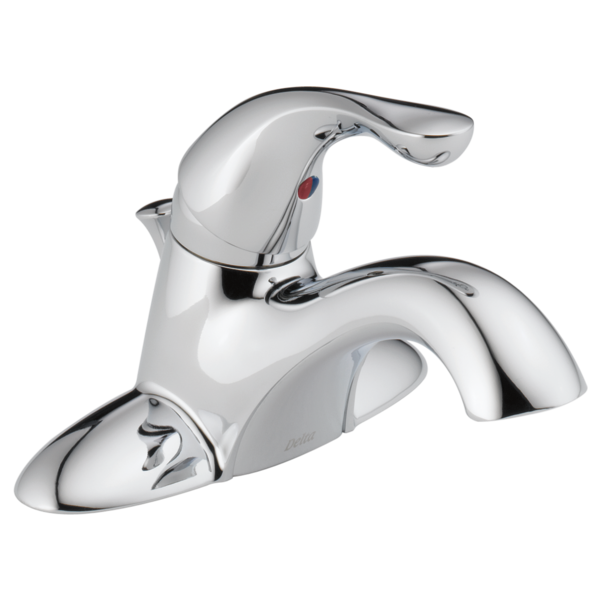 Rated 3 out of 5 by Lion from Mid Grade Faucet Overall a good performing faucet, metal handle, however, the faucet body is plastic. At this price range, I would expect a solid metal faucet body. Easy install, customer likes the unit, as a professional in the industry, I would expect a higher quality body. Rated 5 out of 5 by Trevor84 from Another home run The only reason I don't give this 5* on design is, it is just your basic run of the mill faucet. However the performance and quality is top notch. 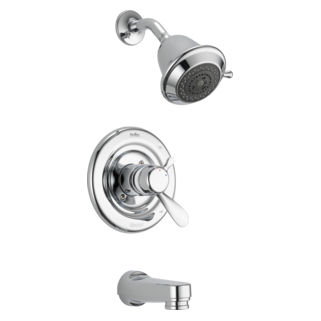 If your on a budget but still want something that can out perform some of the higher end Delta faucets this is a great pick. Rated 5 out of 5 by SKY1 from Great replacement I purchased a Delta Faucet about 8 years ago and it worked really well until the other day. It had a small internal leak. I called Delta and exclaimed the problem and they sent me a new one without any hassle whatsoever. The new one is even more attractive and works with greater ease. It is also easier to clean. I cannot say enough about how well Delta stands behind their lifetime warranty. Rated 5 out of 5 by Floria from Excellent quality I bought two of these faucets to replace two 15 year old Kohler faucets in the kids bathroom. I like the lever style for kids instead of separate handles. It feels very solid and the stream is excellent. No play in the handle; excellent components. Love the finish! 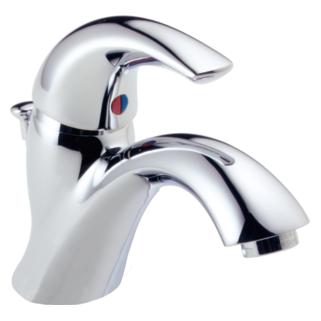 Rated 5 out of 5 by BSampson from Great dea on a great faucet The price was very competative and delivery was prompt. We are pleased with the product. Is stainless in the bath faucet the same as the artic in the kitchen finish ? Thank you for your question. There are subtle differences between the Stainless Steel and the Artic Stainless. The Artic Steel has a blue undertone and it is a closer match to most stainless steel applicances. What does 50/50 pop up mean? Why is this faucet (Delta 520DST) SO LOUD? I had this installed yesterday and last night I could hear it running all the way on the other end of the house. I have never heard a faucet be this loud. We have a customer that can not get the faucet handle to turn off all the way. Have you had any problems with this? It doesn't quite turn off completely leaving the faucet to drip.